INCOMING!! Conversation Bombs – Part TWO! That’s right, my last post about things people say that catch you completely off-guard just wasn’t cutting the mustard. And speaking of mustard, who have I to blame? Food shows! First, it was Bizarre Foods with Andrew Zimmern on the Travel Channel, where Zimmern suddenly dropped into his monologue that he was homeless for a year. With no explanation. And now? The same thing happened on Extreme Chef (Food Network) last week! 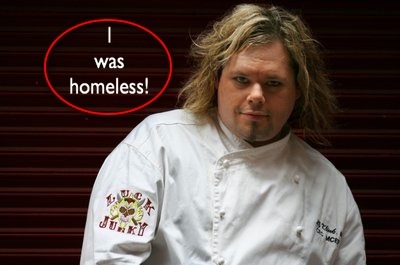 One of the contestants casually mentioned in his voiceover, as I watched him run inside an ice warehouse for a rabbit carcass, that he had been homeless. Once again, no explanation. My husband looked at me and waited. I was already gesturing aggressively towards the T.V. “Is it a chef thing?” we wondered. Is that why they don’t mind the 100-degree kitchen and unreasonable hours? And why they always want to be surrounded by food? Any food? Of course, this also had me going back through life’s little gems so I could provide you with a new list of conversation bombs. Yes, these are all things people have actually said to me. Give a girl some warning, wouldja? Ms. Teacher: Do you know anyone who wants a dog? Peppermeister: No, why? Are you getting rid of your dog? Ms. Teacher: Yeah. My husband’s leaving me, and taking the house, and the apartment I’m living in doesn’t allow pets. Your turn (comment below!) – Bombs Away! Previous postIt’s Official. I Rule. I later learned that he liked to dress up in a cloth diaper and hang out on the front porch. All of my paper towels and tissues were gone, but none of my toilet paper was, and for months I kept finding large safety pins on the floor. Um, so, I’ve decided to start a contest called, Best F*cking Comment Ever, and you just won it. Awesome! Do I get a cookie? Because I totally can’t write about that on my own blog. Too many people know the boss, and I never told him. You haven’t had cookies until you’ve had my cookies! We might be able to work something out, especially if you keep using my blog as a place to post hilarious, jaw-dropping comments that are too risky to post on your own blog. Really, that story is unbelievable – I made my husband read it right after me!